Be Prepared!!!!! If you start teaching and don't know what comes next, you will lose the respect and attention of your team. Put your team in a formation and not just standing anywhere - structure is a great thing! SHOW what you are teaching FIRST to give the team an idea of what you expect. Obviously you can not show the stunts but you can do the motions. When teaching, there is a formula that works great: Teach feet / legs first, arms next and then add the head motions. ALWAYS cue the upcoming movements BEFORE they come up. GIVE COMPLIMENTS as you go and reinforce the positive commitment that your team is trying and learning. 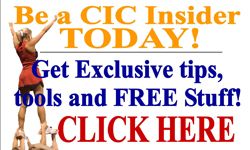 For more Great Tips, Tools, Ideas and Curriculum to help you have the BEST Cheerleading Season, Join the #1 Cheerleading Resource Community TODAY – Click HERE and Get Your FREE BONUSES with your membership! Are you ready to have AMAZING Cheerleading Jumps? 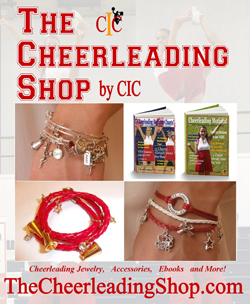 Let us help you get there quickly with the Cheerleading Jumps Book from the CIC Cheerleading Mastery Series! Detailed photos, descriptions and tips of the 8 Cheerleading Jumps including: the Toe Touch, Front Hurdler, Straight Jump, Tuck, Herkey, Spread Eagle, Double Hook and the Side Hurdler. 3 Easy Stretches to improve your flexibility. 5 Jump Exercises to give you gorgeous jumps. 9 Common Mistakes and Easy Solutions. 6 Practice Tips to help you practice on your own. Detailed breakdown of the approach and landing of your jumps. Practice Log to help you reach your jump goals. Q: Help! I am a new coach and I need some help in motivating my cheerleaders during practice and to get them to take it seriously. Set Season and Daily Goals for your season and have your team set them with you. At the beginning of practice, remind your team of the season goals that THEY set and then set goals for that practice to help them stay focused on your outcome. Athletes generally perform better if they know what they are working toward. Everyone will receive a piece of candy if you get through your new chant with stunts. Your next practice will have a fun theme. Play a game or do a fun team building activity. Give out a “Spirit Stick” or team Mascot Stuffed Animal to take home to the most outstanding cheerleader that day.